I recently read Aliens: Rogue. I as wary, because I love both Aliens and Predator worlds and I recently experienced the horror of reading recent comics who destroy the lore and setting thanks to the (more or less) recent movie Prometheus; They are so bad I'm not even going to waste time writing the reviews, just stay away from them. Anyway, back to this title, it was a nice surprise. 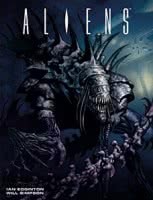 An aliens comic like the old ones, with twists and fresh ideas but without polluting the core concept of aliens. A scientist on the brink of madness has apparently been able to tame Aliens, by genetic engineering. And even more terrible, he's been able to "build" an alien king. But of course things never go 100% well and hell breaks loose. Interesting and well drawn, I enjoyed it.